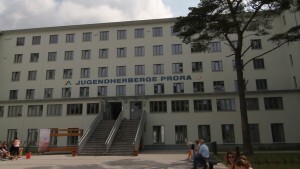 The Jugendherberge is a youth hostel located in Prora. Opened in 2011, the hostel is Germany’s largest, featuring 402 beds and 96 rooms. The hostel was the first section of Prora to be redeveloped and was considered a model for green architecture at the site. The design, by the Dutch firm Atelier Kempe Thill, was selected from an international design competition.